Nourish your heart with creativity. Make something special for yourself or for someone else. Learn how to nuno felt a cozy scarf. I want to show you different techniques for creating interesting surface design through the means of adding embellishments, and manipulating the silk fabric you’ll be using to make the scarf. 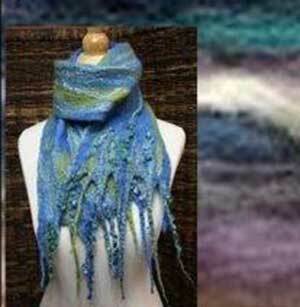 You’ll each make a sample to get the hang of it, and spend the rest of the time laying out your scarf and felting it! The focus of the day will be to lay out the merino wool roving as thin as possible and to create interesting texture with different embellishments. I will have you working all in white – this way you can focus solely on layout and texture without getting too caught up in colours. 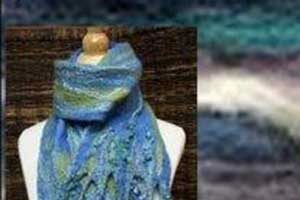 This workshop includes materials: silk, merino and embellishments plus equipment for felting.